Hello, everyone. 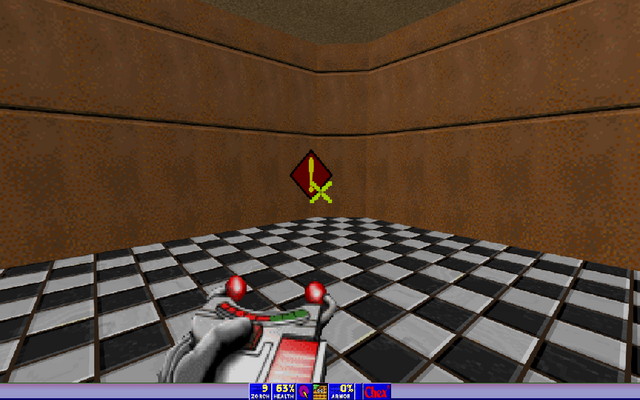 I'm working on a map for The Ultimate Chex Quest using the Doom Builder 2 configs from http://www.chexquest.org/index.php?action=downloads;sa=view;down=110 but when I load my map in game the keys at least show up, but they don't actually add a key to the player's inventory. The pickup message shows up, but nothing gets added to the inventory, so doors still say that you need the appropriate key. The only way to complete a map is the GIVE cheat. In fact, the maps already in TUCQR6 all seem to have this problem. I tried removing the keys' DECORATE code from my TUCQR6 in SLADE, but that just made a box with an exclamation point show up where the keys were supposed to be. I'm on the latest version of GZDoom (3.7.2 as of my writing this) and would really appreciate it if someone could help me out. Thanks in advance. R7 is coming eventually. I promise. Try running R6 in GZDooM as an IWAD by using the -iwad extention, Or by specifying it as an IWAD in your launcher, and see if that helps. That's what I've been doing, I've even added an IWADINFO lump to make things easier, but no effect. Does anyone else have this issue? I just tested it on my Linux box, and the key showed up in my inventory when the display size was set to 11, but still didn't work. GZDoom complains about all kinds of stuff being defined twice in the DECORATE script when you launch the game. Renaming it to "ChexBlueKey" fixed the symptom of it saying "Tried to define BlueCard more than once" on startup, but not the actual problem. What I don't understand is how simply getting rid of the code caused the exclamation point problem - there isn't one line of code in chex3's DECORATE pertaining to the regular keys (only the skull keys) and it works just fine. Is there something wrong with the DEHACKED script? A cursory check on that revealed nothing, but what else could be causing this? If we find the problem, would you mind releasing a bugfix patch for TUCQR6 to tide us over while we wait for R7? Thanks for the help, and it was great meeting you. Oh, one more thing, a temporary fix is deleting the DECORATE code for the keys and using FreeDoom Phase 1 as the IWAD. That's pretty weird, because FreeDoom Phase 1 doesn't have a DECORATE script, so logically it should act the same as when you run TUCQR6 as an IWAD. Neither FreeDoom's nor TUCQ's DEHACKED script seem to be doing anything relevant to this problem, so all I can say is, I'm stumped. IIRC this is a known bug with newer versions of GZDooM. It should be fixed eventually.